YPG confiscated a numismatic(?) 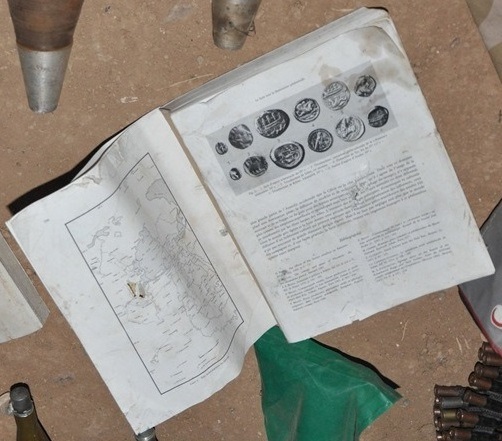 book from Turkish Islamic State fighters in Syria. Do you recognise it? It’s not clear whether the book is archaeological or historical; whether the book is structured geographically, chronologically or technologically; even which place(s) the book covers, though it seems safe to assume that it covers the Ancient Near East (ancient south-west Asia and north-east Africa) and perhaps the medieval Islamic world. The images are too small/low-resolution to reverse search for the visible coins, so identification will probably be dependent upon someone seeing the page and having a memory flash. Still, thanks to Alexis Christensen @ProfChristensen, A. Craig Copetas @ACraigInParis, Agathe Ducrayon @a_ducrayon, Shawn Graham @electricarchaeo, Geraldine Lepere @Gelepere, Colleen Morgan @clmorgan, Christopher Whittell @Whittell1880, Donna Yates @DrDonnaYates, José Antonio González Zarandona @jagzarandona and others (privately), as well as an ever-growing string of retweeters of the image (which is now the right way up), it’s getting seen by the right people, so there is an albeit slim chance of success. 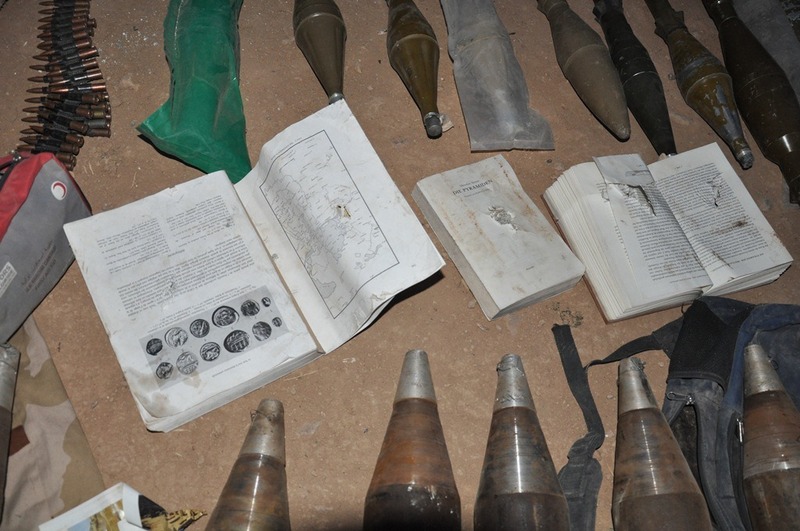 And it is a trivial concern, literally beside heavy weapons, but it might help us to identify which ancient coins the Islamic State is handling (or expecting to handle). Thereby, it might help us to trace how the Islamic State is funding itself through the trafficking of conflict antiquities. So it is not a pointless question. Agora Auctions‘ Tom Mullally, Numismagram‘s Jeremy Bostwick @numismagram and Portable Antiquity Collecting and Heritage Issues‘ Paul Barford (as well as, beyond the web, archaeologist Peri Johnson, numismatic historian Daniel Reynolds and public archaeologist Chiara Zuanni) have identified the coins as ones from pre-Hellenistic and Hellenistic Phoenicia, specifically from the mints of Tyre, Sidon, Byblos and Arados on the coasts of Lebanon and Syria (though obviously they were used and may have been deposited elsewhere). 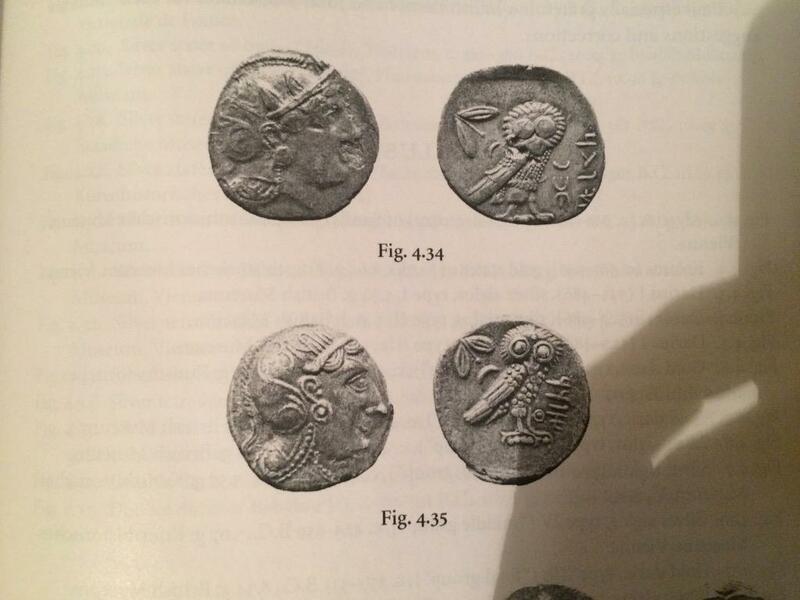 Christopher Whittell thinks that, although it is ‘not clear’, the second coin might be an ‘Egypt[ian] tetradrachm of Artaxerxes IIII or Mazakes’ from the Fourth Century B.C.E. 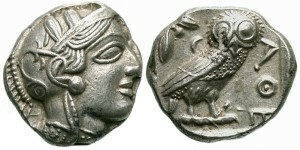 Might it be an Athena/Owl tetradrachm from the Sixth or Fifth Century B.C.E.? Stretching my weak memory of actual archaeology even further, it almost feels Archaic. The first coin is likely a Persion siglos. The second coin is an Athenian tetradrachm ((imitation?). The fourth coin is a hippocamp stater from Tyre. Fifth is a different hippocamp stater from Tyre. Sixth is a starter from Arados. For reasons that will soon become obvious, @ghumdan thought that it might be German; Anthony Russell thought that it might be French, while Barford thought that it might not. Due to the fact that the fighters were Turkish, many of the other documents were in Turkish and many of the words seem exceptionally long (as Turkish is an agglutinative language were phrases and sentences can be formed by adding numerous suffixes to single roots), I thought that the text might be Turkish (though I simultaneously thought that there were too many short words for it to be Turkish). We still don’t know. Sarah Parcak @indyfromspace, who has even better eyesight than @ghumdan (or, rather, than whom I have even worse eyesight), is confident that the book is French: ‘You can see accents and numbers.’ Once she’d been prompted to look for them, Donna Yates could ‘see accents now too in the paragraph’. I still can’t, even with my glasses on. Perhaps some things are marks on the page or glitches in the image, but Emily Bushold @ArchaeoEmily, A. Craig Copetas @ACraigInParis, Agathe Ducrayon @a_ducrayon, esnible and David Knell David Knell, Twitter, 5th June 2015 have managed to pick out a few French words, so it is definitely a French-language text. ‘Easier to see on [her] phone’, Donna suggests. I’ll blame the tech instead of my eyes. Anyway, Sarah may be able to enhance the imagery. But they don’t invest any intrinsic value in the books, or in the knowledge in the books, any more than they do the objects in the books. They do only care about the money, but they have to know what they’ve got, in order to get as much money as possible when they sell it. Since the first remaining page seems to be the end of an article and the start of its bibliography, it seems that one or more chapters has been extracted to be used separately (or deemed useless, removed and thrown away). @ghumdan, whose eyesight is evidently better than mine, looked at the uncropped photo and was able to read the title of the book next to the one that was spotted first. 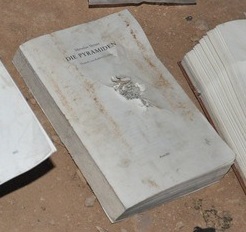 Curiously, it was ‘”Die Pyramiden [the Pyramids]”‘… Did the book have useful information on antiquities? Were they planning on selling the book itself? Were they studying military strategy and political symbols in history? David Knell says that the third book is ‘also about the Pyramids in Egypt’. Thank you! We seem to be reaching a consensus on that, so that’s great. “Die Pyramiden” appears to be the book by Miroslav Verner, published by Rowohlt, 1998. What’s bother me is the map on the back page. Is that a triangular body of water? I don’t recognize it. Anyone? Thank you! The book looks like a collection of papers, so that map might show somewhere else – a crumpled-up Black Sea? Who knows? It could be a map of a lake for a chapter about a village, for all we know. It does look like a collection of essays which would make it hard to figure out from the low quality image. If it’s a monograph, a potential author is Josette Elayi, an authority on coinage of the region who publishes in French. I’ve ILLed some things to check.